How do I get an alarm from our station that’s 17 miles from here? The situation: Plant operators needed notification and a log of events or alarms happening at a remote pump station, 17 miles away. The options: First, the engineers considered installing dedicated leased phone lines with modems. But when one engineer asked if anybody really remembered or understood the AT codes the modems used (back in the early Internet days), and noone did, they dropped that option. Next, they investigated license-free wireless. That proved impractical: There were hills and valleys between the plant and remote station (no line of sight), and they’d have to lease property between the two locations and install repeater towers at an additional expense. So, how did they get the data across 17 miles without leasing land or resurrecting obsolete technology? The answer was much simpler and less expensive than they anticipated. Engineers decided to use a pair of industrial cellular modems, communicating over the GSM cellular network (the one consumers use for texting). The key feature: unlike a consumer cell phone, the industrial cell modems have discrete I/O or an analog input. Not only can cell modems send a text message or an email, but they can do wired-in/wired-out control logic. A logic state change on a digital input or an analog alarm level triggers the cell modem to send a text message (also known as SMS), which can be formatted as a control statement. The receiving cell modem controls the logic state of its output relay according to the control statement it receives. A contact closure at the input results in a contact closure on the output: wired-in/wired-out, with a distance range limited only by the cellular network strength and coverage. The plant people scouted the remote pump station area with a couple consumer cell phones, each with a different service provider, to make sure the cell phone service they purchased for the cell modem would have signal strength at the remote site. The survey showed 3 out of 5 bars, entirely adequate signal strength. The project required a pair of cell modems, each with a standard antenna attached to the modem. The conventional 24Vdc power supply used to power the modem was sourced from an existing UPS battery back-up. 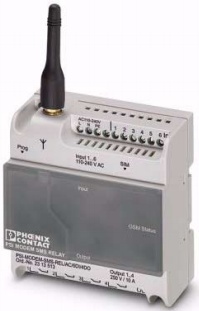 The discrete inputs (dry contacts) were wired to the cell modem at the pump station. The second cell modem was installed at the plant, with its discrete relay output wired to an annunciator panel. They also set up an email account to track and keep a log of the events from the remote station. The plant team bought two cell phone service packages with SMS text messaging and text-to-email from their local cellular service provider. Then, they inserted the SIM cards into each cellular modem, and configured the modems with a Windows app. To ensure security, they enabled password access on the accounts. Next, the engineer formatted the text message with the appropriate syntax, so the digital output on the receiver end followed the state of the discrete input on the sender end. To confirm that the remote station cell modem is still powered up and online, it sends a once-a-day “I’m alive” text message. Testing showed that the time delay between an alarm state change at the pump station and the plant end was between 10-14 seconds, which was deemed entirely adequate for remote event logging and alarming. This entry was posted on December 20, 2011, 10:28 am and is filed under Cellular, Communications, Wireless, Wireless. You can follow any responses to this entry through RSS 2.0. You can leave a response, or trackback from your own site.